February’s book club was at my friend Jess’s house and she picked Jacqueline Kennedy: Historic Conversations on Life with John F. Kennedy by Jacqueline Kennedy Onassis, Michael Beschloss, and Caroline Kennedy. Crazy, happy that us ladies do this every month! This is such a unique book and I’m so glad Jess picked it. 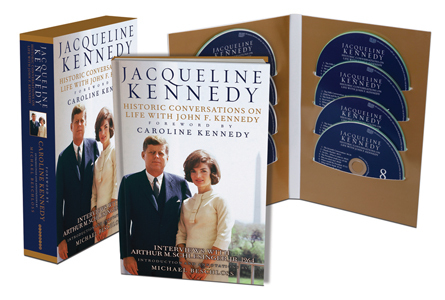 In 1964, in an attempt to preserve her husband’s legacy, Jacqueline Kennedy recorded eight and a half hours of conversations detailing her first-hand accounts of John F. Kennedy and insights on many of the people and events which helped to shape the presidency. It took me weeks to decide which version of this book to buy. Seriously, with the book version at Barnes and Noble costing $60.00 and the Kindle version lacking the audio cd’s, it was a toughie. I ended up locating a brand new copy on Amazon for half the price and I’m so glad I did because the book is only a transcript of the conversations and the cd’s really brought the interviews to life. Not only could you hear ice tinkling in Jackie’s glass and cigarettes being lit, but you really were given a glimpse into the life of this notoriously private person. The Good: You’ll learn a lot about JFK and his presidency. I have always been enamored by this seemingly cursed family and their brief reign of Camelot so it was very exciting, and somewhat intimate, to delve into their lives with Jackie as my tour guide. I also loved how wonderfully personal some parts of the interview were, for instance, during the Cuban Missile Crisis, Jackie begged the President not to send her away so that if their worst fears came to fruition they could stand on the White House lawn and die together as a family. Other parts were filled with juicy gossip tidbits, like President Eisenhower’s wife did not want “that woman”, meaning Jackie, in her house (or as us mere mortals know it, the White House). The Bad: The book’s greatest fault is its failure to include more about the personal lives of the Kennedy's. Arthur M. Schlesinger Jr., the interviewer, was primarily concerned with asking Jackie about her husband’s feelings concerning various world leaders, somewhat interesting, and members of America’s government, not so interesting. There was so much talk about people that I’ve never heard of before that I truly believe that had I only been reading the transcripts, instead of listening to Jackie, I would have been bored silly. I was also frustrated with Schlesinger because he was given such a unique opportunity to find out more about Jackie herself and he squandered it by only focusing on JFK. And lastly, I know this may be perverse, but I was really hoping to hear Jackie’s thoughts on the President’s assassination and unfortunately, they never came. We were warned in the foreword that because the interviews were done in the months following the President’s death and because Jackie had been interviewed by another man around the same time that Schlesinger was not going to put Jackie through the ordeal of answering more questions about the tragedy. However, I was hoping that those interviews with the other interviewer would be included and I was disappointed when they weren’t. Bottom line: This book is a piece of history (and how often can you say that? ), about a legendary family and it should be read. True, parts of the book were dry but the confidential and intimate parts more than made up for it. Oh, and don’t screw yourself over by trying to pinch pennies, spend a bit more and get the cd’s. And onto the next . . . I finally finished the The Disappearing Spoon: And Other True Tales of Madness, Love, and the History of the World from the Periodic Table of the Elements by Sam Kean.